A few weeks short of four years since the last Olympics, Stratford's stadium is once again open for business. 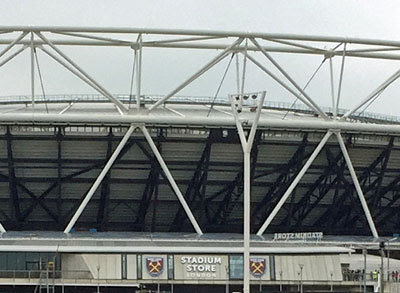 It has a new name - London Stadium. It likely has another new name waiting in the wings, courtesy of an unexpected sponsor. And the inaugural event wasn't football, nor athletics, nor any other kind of sport - it was AC/DC. It's taken rather longer than expected to make ready the former Olympic Stadium for West Ham United. Originally the 2014/2015 season was pencilled in, but instead the first match won't be until August 2016, a showcase friendly against Juventus. Floodlights have been lowered, a proper roof has been added to keep fans dry, and retractable seating has been installed so that the athletics track doesn't get in the way. There's also a 15,000ft² retail building, the Stadium Store, inserted around the southern rim of the external concourse. It already has its name and two hammer badges slapped on the front, and soon you'll be able to buy all your favourite claret and blue merchandise once the existing flagship store in Upton Park closes down. E13's loss is E20's gain, or more realistically E20's gain is E13's loss. But West Ham will only be on the pitch for a contracted handful of days each year. An annual slot from the end of June to the end of July has been safeguarded for athletics, not quite in perpetuity but for the next 50 years, which is near enough. 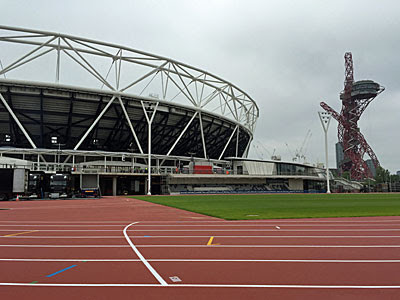 The intention is also to rope in a wide range of other events, as is evident from the London Stadium's intention to become "a superb multi-use venue to bring fans together, closer to music, sport and entertainment". Hence it's no surprise to find a hard rock band like AC/DC headlining the first official show, not least because their late middle-aged fans are likely to be able to afford the £65, £75 and £95 tickets. Seat prices for the 2012 Olympics look positively reasonable by comparison. If you were on the Park side of Stratford yesterday you'll have spotted the invading army. Most made identification easy by wearing an AC/DC t-shirt, invariably in black, ideally from a past tour to show longevity of devotion. 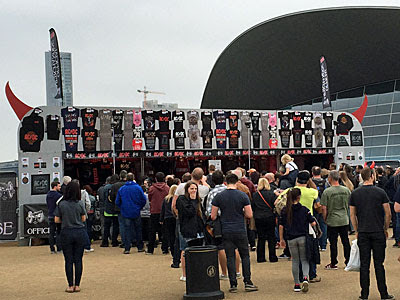 For those unsuitably garbed a series of merchandising stalls had set up, where the official tour t-shirt was proving more popular than the £50 West Ham AC/DC football shirt. The majority of the fans were fifty- or sixty-something, meaning long hair was no longer an option, but several younger folk had turned up, including a significant cross generational strand attending as a father/son combo. They didn't quite swarm, more flock, as the evening concert ticked round. But they did bring a hint of 2012 back to the area, as West Ham's impending presence also will, and a new normality kicks in. It was instructive to observe how events are to be managed at the stadium, again with echoes of four years ago. The natural river perimeter of Stadium Island was once again put to good use, with access to the inner core available only via five checkpoint bridges. Gates opened at 3pm, which trapped you on the island with only a ring of catering trucks for company, before the stadium itself opened two hours later. The most fortunate ticketholders had been assigned to Bridge 1, immediately opposite the main entrance from Westfield, where they queued for checks and bag searches before being admitted to the inner ring. 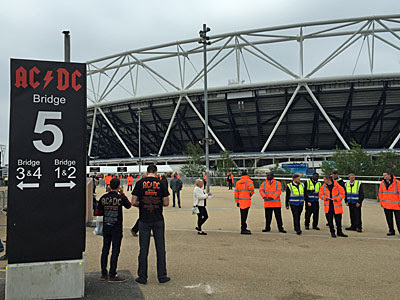 Next in terms of convenience came Bridge 5, down by the Orbit, incorporating the designated entrance for the media (which explained the relative lack of AC/DC t-shirts in this particular line). But the other bridges are a bit more of a trek away, as many found out to their cost at the Olympics, and more will be finding out in the future. Bridge 2 is a five minute walk from the main Westfield entrance, heading upriver to the top of the adventure playground, now protected by a row of thick metal bollards to prevent inappropriate vehicular access to the island. Bridge 3 is a few minutes further on, diametrically opposite Bridge 1, although it's easy to get disoriented and not realise how far round you've gone. Bridge 3 is actually over a mile from Stratford station, so if you're ever at an event where this is your designated entrance then Hackney Wick is rather nearer, at a mere half a mile's stroll. As for Bridge 4 this isn't truly a bridge, more a set of steps up to the outer concourse, and was only being used for staff admittance. It's blatantly the backdoor entrance, with access to all the VIP seats, and at two kilometres from Stratford it's furthest away of all, with Pudding Mill Lane DLR the closest station. It's not yet clear whether the same siege mentality approach will be taken for West Ham matches, or whether the ring of turnstiles will provide an adequate perimeter. One would hope the latter, allowing access to the landscaped slopes of the island, plus various bits of Hammers infrastructure shipped over from Upton Park or installed from fresh. If not, then one complete circuit beyond the edge of the Island takes twenty-five minutes, I've timed it, and I don't recommend you try the same. What was very apparent yesterday were the security personnel, who were everywhere in their hi-vis, both at the entrances to the bridges and at several points roundabout. I can also report that the fountains near the Aquatics Centre, the snaking water feature that visiting kids adore, were turned off to prevent congestion as the AC/DC crowd milled through. The southern Olympic Park isn't quite such a family-friendly destination when a stadium event is underway, so you might want to check beforehand if you're planning on bringing children. I didn't hang around for the concert, but I can report that the AC/DC PA was vaguely audible from 1000m away, if entirely unrecognisable. A series of very loud bangs could also be clearly heard, so I'm glad I knew this must be Angus Young's encore and not a dozen explosions of potentially dubious origin. Their timing suggests Newham has imposed a ten thirty curfew, which'll be good news for anybody living rather closer to the stadium, either now or in the future. London Stadium is such a new concept that they have fewer than 200 followers on Twitter, and the website is presumably equally little troubled. Here we learn that very few events are currently scheduled at the venue, bar some athletics next month and some rugby league in November, and no other rock groups whatsoever. We also discover that blankets, pole-free flags up to 1m², food and fruit for personal consumption, sealed plastic bottles and thermoses, seat cushions and small umbrellas are permitted inside the stadium, but not cans, camcorders or selfie-sticks. And from August you'll also be able to go on a tour of the stadium with multimedia features (including "footage of matches, races and concerts"). I have my doubts that it'll be "the tour of a lifetime", especially having read the job description of a Tour Experience Maker, which is to meet and greet customers arriving for tours, sell tickets, distribute audio handsets, and take/sell commercial photo opportunities. Meanwhile the one big remaining question is what London Stadium will be officially called. The naming rights have already been sold off and an announcement must be imminent, particularly if we're all supposed to be using the sponsor's title by the start of the football season. And while you might be expecting a big name company to step in, all the insider information suggests this won't be the case. An Indian conglomerate called the Mahindra Group are reported to have stumped up £6m a year, less than half what was originally hoped for, in an attempt to raise global awareness of their Mobility/Rural Prosperity/IT/Financial Services/Clean Energy/Business Productivity portfolio. So the Mahindra Stadium, then, an internationally ludicrous commercial imposition? Or perhaps there is method to this apparent madness. Mahindra have recently launched a new electric car in this country, which they're hoping will be a low-emission gamechanger, and the previous Mayor even contributed upbeat words to the press release as if he knew what was emerging behind the scenes. This pricy hatchback has a top speed of 50mph and a range of 75 miles before you need to plug it back in, so is seen as an urban runabout rather than a full automotive replacement. And its name is the e2o, which if you tweak the typography looks like E20, which is the postcode of the Olympic Park. I'm convinced this is no coincidence, and that the impending title of the post-Olympic arena will be the Mahindra E20 Stadium, or some rearrangement thereof. I'd quite like to be wrong, but if we must have a commercial moniker imposed, at least this is far less ghastly than it could have been.